The closest I’ve ever come to having a spiritual experience was thirtysomething years ago when I was on drugs, so I’m not really sure that counts. I was in my early twenties and managed a record store in Times Square (and boy, does that sound like ancient history). I also shared an apartment with my friend Steve (this was way before he found God) in Jackson Heights, Queens and all I really remember from that hazy time was the two of us getting high regularly, listening to the Allman Brothers Band and Steely Dan and eating lots of pizza. So here’s the spiritual part of the story. One morning, I woke up from a terrible dream where someone with a gun was chasing me. This would become a recurring nightmare in the years to come, but what really freaked me out that morning was hearing the phrase “shot in the head” over and over, as if some spectral madman was whispering in my ear. I shakily went to work in the afternoon and as soon as I stepped foot in the record store, George, the assistant manager who was an even bigger stoner than I was, came running up to me. I froze. And then felt my heart beating out of my chest. “What did you say?” I asked him. It felt like I was back in my bad dream. Carlito was a petite, gay Brazilian man with a bad complexion, who appropriately worked in the International section of the record store. He had impeccable musical taste and turned me on to Milton Nascimento, Caetano Veloso and all of the Gilbertos. He was also a white witch who practiced Santeria. It just so happened that Carlito lived a few blocks from me in Jackson Heights and knew where I could buy this especially fresh poultry in our neighborhood (and no, it wasn’t KFC). I paid a few dollars to an old man who didn’t speak English and was given an extremely angry bird, all trussed up in a burlap bag. When I got to Carlito’s place, he took the bag and told me to follow him into the kitchen. He was wearing several beaded necklaces and a feathered headdress, and as evidence of where my head was at, I didn’t find that particularly unusual. He then began to chant a few words in what sounded like Portuguese – while holding the chicken by its neck in one hand and a knife in the other. 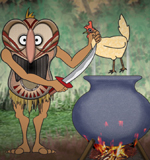 After reciting a long incantation, Carlito then sliced the chicken’s throat with one deft stroke. He meticulously drained its blood, pouring some into a small cup and pointed me to the living room … where he proceeded to rub the dead chicken all across my arms, legs and body while again chanting something that sounded like Milton Nascimento – if he was providing the soundtrack to a horror movie. I stood there completely still, paralyzed with fear, thinking that this was the single craziest thing I had ever done in my life. And that maybe it wasn’t really all that crazy because it was going to save it. Carlito motioned for us to sit down in front of what looked like a small makeshift shrine and explained that sacrificing the chicken was a gift to the spirit and sign of devotion. He then slowly poured a cup of chicken blood (it’s good for the soul!) over the shrine and lit a cigar, symbolically blowing smoke into the spirit’s mouth. That was followed by taking a long swig of rum and spraying it pretty much all over the place. It was now time to ask for the spirit’s help. Carlito appeared to be in a trance, chanting wildly and the only words I understood were my name and “protect.” When he finished, he handed me four chunks of coconut shells and explained that I needed to ask yes or no questions about the future and then roll the shells like dice to divine the answers. I remember doing this and also something about if the shells came up on the black side or the white, but to be honest, I was more concerned with the immediate present than the future and just wanted to get the hell out of there. Carlito announced that I was now protected and would no longer have to worry about being shot in the head. Obviously, things turned out for the best. Soon after this encounter, I quit working at the record store and stopped taking drugs. Unbelievable! Milton Naciemento on vinyl!